With only two more weekends of Overwatch league matches left until the end of the inaugural season, we're at the point where it will not only come down to how the teams play as a collective. But those special individual moments of brilliance that would have us go from the edge of our seats, to jumping up and down like madmen. 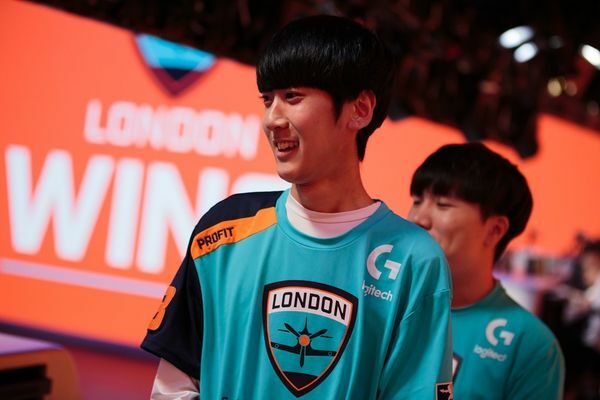 One of the players in the league with this ability is Jun-Young "Profit" Park, the most underrated player on the Spitfire and in the Overwatch League. This season has been a tale of two stories when it's come to the play of the London Spitfire. The first half showed a confident, in command and bossy team, that clearly excelled in compositions that suited the dive meta. They were confident and able to play to their strengths in those first two stages, proving they deserved their contender title by winning stage one and finishing third in stage two, the second half of the season was a completely different story. Stage three showed a massive dip in form but most importantly the teams level of cohesion seemed to be completely out of sync, to which the team later revealed that there was on going internal issues that lead to four players being moved to the inactive list and later released. This resulted in a stage four rebuild to get everybody on the same level and while Spitfire fans have seen the good, the bad and the ugly at times. The one and most underrated constant the team have had, has been the carry style that DPS player Profit has provided. If you take it back to the first two stage, especially when reflecting on the playoffs, almost everyone will mention the Birdring performances in both situations. Mainly due to how strong Widowmaker has been in the early parts of the Overwatch League season, Birdring was both praised after his performance on her in the stage one finals but also questioned for the stage two playoff performance against the Philadelphia Fusion. Profit however, has been one of the most consistent player at the DPS position throughout the whole season, to a point where it is more of a detriment to recognising how much he has carried London at points throughout this season. Stage one was when the Spitfire were in the prime in the Mercy Dive meta and when they’ve been their most comfortable. Profit started to show how good he was with 10.86 final blows per 10 minutes in 511 minutes resulting him being ranked 5th in final blows per 10 and 10th in most minutes played. While mainly played Genji and Tracer his two preferred heroes, it was in stage one he also became Mr 100k, with the Rip-Tire ultimate on Dorado that fragged Ark of the NYXL to win stage one. Stage two was much of the same, with the Spitfire still very comfortable in the Mercy Dive Meta, they continued to look dominant up until they were, at the time surprisingly beaten by the Philadelphia Fusion in the semi-finals of the stage playoffs. While it was that performance that showed the start of Birdring’s wrist injury that kept him out for almost a stage. Profit continued to shine under the radar with 514 total kills, 9.16 kills per 10 minutes and 4.16 kills/deaths per 10 minutes, meaning he was ranked second for stage two in all three categories. Stage three was an entirely different beast and composition, to that the Spitfire had known. With this being the switch away from Dive and towards a more tank and Widowmaker orientated meta. The Spitfire started to struggle and with Birding’s injury being longer than expected, the cracks of the now known division in the team started to show. Profit at this point was moved from his now customary supportive DPS role back to being the main DPS Carry. While he again performed and was one of the few on the roster who did. Team results and the expectations that where placed on Hooreg overshadowed his performances. He ended top five in kills and fifth in kills per 10 minutes with around 9.50, which considering their drop in performance was incredible and highlighted just how consistent he is as a player. Stage four was London’s rebuild, in week two the team announced that four players would be moved to inactive roles. One of these was Hooreg, Profit’s DPS partner from GC Busan and it ultimately designated Profit to being the teams supportive DPS player. During this stage Profit started to take his new role in a direction that fitted his play style. While she is known for not being his favourite hero to play, Profit learnt Brigitte and became the best player in the league on her, while also learning the new Hanzo who wasn’t eligible for competitive play and improving a lot on his Pharah. Stage four showed a development in his game that helped move him towards being one of the best supportive DPS players in the league. This has rolled into the playoffs themselves with Profit elevating his game alongside his Spitfire team mates. At the time of writing Profit was seventh in eliminations with 17.1, sixth least in deaths with a minimum of 1 1/2 hours played at 4.46 and second with an average of 8996 damage per map. So while Birdring and Fury are getting the plaudits for their play, Profit's unrecognised support DPS style has allowed the rest of his team to make plays and the Spitfire to kick it into another gear, similar to the form of stage one at the perfect moment. It's actually in my opinion a crime that Profit wasn't mentioned in either the MVP or All Star voting considering that he's only missed 8 maps all season.